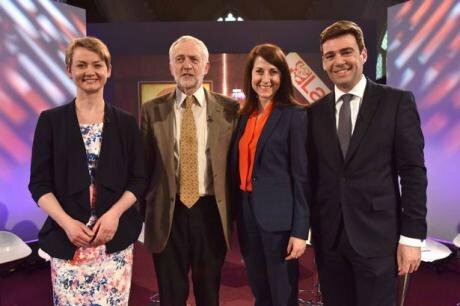 The Labour leadership election reveals a party stuck in the past. The Labour leadership contest is noteworthy for a number of factors, none positive or helpful for the party.Labour have just suffered their second consecutive defeat. They finished 113 seats behind the Tories in England. It has now become a cliché to say they face an existential crisis; as Matthew Norman pointed out in The Independent this week, it is in fact a ‘post–existential crisis’ (1). The party is in collective denial, retreating into its comfort zones, and almost numb at the position it finds itself in.Previously when Labour lost (and it has lost many times), the party did attempt to wake up and regroup. Post–1979 the party in opposition had five leadership contests. Excluding the Benn kamikaze run in 1988, when he won a mere 11% of the vote, the other contests – 1980, 1983, 1992 and 1994 – all provided rich evidence of a party with debate, energy and ideas. No longer.This is a defining moment about whether Labour has a future, what it is for, as well as for centre-left British (and in particular English) politics. Here are ten observations about the state of Labour and the current contest:1. Labour doesn’t understand the extent it was rejected by voters on May 7th 2015. It wasn’t just Scotland; it was England; retreat in Wales; London not being as good as people kidded themselves; the Northern English retreat and UKIP; the South East absence. And much more. Not exactly ‘One Nation Labour’.2. Labour has seldom won a national mandate for change. Love or loathe Blair, but take his three election victories away and Labour has won working majorities twice in its history: 1945 and 1966. That’s right twice – once after five years in a coalition wartime government, and the other after a year and a half with a small majority.3. Labour doesn’t understand Conservative England. You could just say Labour doesn’t understand Tories. And as well as that, it doesn’t comprehend England. Labour and left–wing culture has consistently taken refuge in a series of diminishing stereotypes which paint Tories in one-dimensional colours – as selfish, uncaring and worse. Put the two together and Conservative England is at the heart of Toryism. And Labour have never come near to showing an understanding of its appeal, traditions and history. That has been a big historic disadvantage for the party. 4. Labour and Scotland. Scotland was once a ‘banker’ for Labour. At Westminster this was true until a few months ago. Labour now faces another nation it doesn’t understand. And another political tradition – Scottish nationalism.Scottish Labour views Scottish nationalism with more incomprehension than labourites have historically viewed Toryism. That is a worrying and terrible precedent and one which has produced similar results.5. Labour and public services. This is a story of consistent lack of imagination and defensiveness – even at the height of Labour’s strength. Think back to the supposed ‘spirit of 45’: at the time and immediately after on Labour left and right there was disappointment at its lack of radicalism and democracy, its centralisation and the bureaucracy of Morrisonian nationalisation.Forty years after the start of Thatcherism, people still talk of ‘defending jobs and services’, ‘defending’ the NHS, the BBC and more, while the right get on with a politics of building autonomous institutions, reproducing their values – and usurping the cause of democratisation from the left.6. Then there is the trade union movement’s conservatism. Trade unions represent 20% of workers – insiders in the job market – and with all sorts of consequences in relation to gender, age, status and rights. When London tube drivers go on strike, as they frequently do, earning £35k-£50k per year, there are similarities with the worst traditions of the aristocracy of labour and self–interest. This isn’t to dismiss the culture of aggressive, adversarial management, attacking workers’ terms and conditions, but to observe the limited value of striking as a method of building public coalitions of support, and that British trade unionism has consistently been made in the image of the capitalism which defines it.7. Left-wing comfort zones about ‘equality’ and ‘inequality’ aren’t enough. Modern capitalism viciously divides people into winners and losers. Historically Labour has identified with losers in society (2). The Blairite ‘Winner’ class turned out to be worse than a dead end.Left-wingers post-‘Spirit Level’ cannot just cite the evils of inequality as proof we are all better off together. ‘Inequality’ is an abstract. People experience life, personally and relationally, and have a very nuanced understanding of positional wealth, income and status – in which people ‘like them’ or near to them define how they see themselves and society.8. The left, work and capitalism. Labour has traditionally defined itself vis-a-vis work and production. But things were never as simple as left class determinists thought, and today they are even less so. We live in an age of a fragmented, uncertain society and economy, with a growing demographic bulge of older voters. Labour seems to have little to say to older voters – beyond trust us ‘we are the party of welfare’.9. What does Labour have to say about the economy and business? There is no advantage in the ‘is Labour pro-business enough’ argument which has gathered strength post-election. British political discourse, including most of the mainstream left, has had little to say on political economy and corporate governance, since the Bennite Alternative Economic Strategy (AES) was unveiled in the mid-1970s. British capitalism, its anti-social business models, endemic short-termism, and its shocking record on research and investment, has been occasionally seen as part of the problem in recent times – such as Ed Miliband’s ‘predatory capitalism’ period – but no substantive proposals emerged from it. Labour have had nothing to say about reforming business since Bennism, and the reasons for this are obvious: the power of ‘the forces of conservatism’ in business and other elites.10. The left language of resistance and tribalism is part of the problem. The left barely understands how it comes over to people not inside its constituency and fully signed up. ‘The world is wrong’ is self-evident; ‘why are you not one of us?’ runs the logic. The next step is to embrace resistance and defensive, oppositional language, invoking ‘austerity’ and ‘Tory cuts’ and feeling self-justification and self-satisfaction. Do people not stop to think that these comfort zones are a substitute for thinking about issues?This brings us to the four Labour leadership candidates. They and the non-debate so far shows how much Labour, its culture, politics, and understanding of itself has collapsed.All of them have qualities. But the three mainstream candidates – Andy Burnham, Yvette Cooper, Liz Kendall – are living embodiments of the incestuous, insular political class. Each of them has said not one original thing in the contest so far.The rise of Jeremy Corbyn is a symptom of this. He is a voice of the past, but is the only one preaching certainty and a message of left principles – whether you agree or disagree with him. That consistency, authenticity and knowing what he stands for has resonated with some Labour activists – and is both a strength and a huge weakness.All of this has taken a long time coming – the 2015 and 2010 defeats, the Blair hollowing out, the Kinnock years of retreat, the diminishing and defeat of much of the post-war settlement, and the long-term caution and conservatism of what passes for the Labour left. This isn’t an isolated British story but an expression of a very Western and global trend: the acceleration of globalisation, fundamental shifts in power, wealth and the economy, and with it the death of Second International parties: the social democratic tradition which began in the late 19th century.What have been the emerging messages of Labour’s non-debate so far in response to this? One is to seek to anesthetise the Labour brand even more – to try to not scare away voters with a message of radical change; the other is to celebrate some supposed golden era of Labour between 1945–75 where the party supposedly knew what it stood for.The first ignores the widespread alienation in what were once Labour heartlands from the party: Scotland and the North of England in particular. Or the growing socialisation gap generationally – which means a whole culture has no connection to things like trade unions and Labour values. The second sees Tony Blair’s three election victories on admittedly diminishing turnouts as perfidy: Labour MP Richard Burgon this week talking of Labour ‘losing five million votes between 1997-2010’ as if it was as simple as identifying New Labour, Blair and Brown as the villains of the peace. These are both instinctual lurches into familiar comfort zones – avoiding confronting the home truths about Labour. Both see Labour’s fortunes as based on returning to a politics of the past – one the near-past of modernisation and moderation, the other, of a more distant past of left sensibility and certainty.This is all emblematic of a party which does not understand what has happened to it, where it stands, and where it wants to go. The prevailing narratives of the leadership contest offer in very different accounts from Burnham, Cooper and Kendall on the one hand, and Corbyn on the other, no real sense of where Labour should go in the future. The era of socialism and social democracy as we have know it has come to an end. It does not have a story, explanation and constituency. Post-socialist and post-social democratic politics are coming across the West – look at the health of the German SPD, French Socialists, even Swedish Social Democrats. Not even Syriza or any other populist left force can for now buck the power of the market.The Labour party looks as if being part of the future is beyond it, but the life support system of the First Past the Post electoral system and Westminster’s adversarial culture give a crutch and pretence that the party has a voice and role. In an age of zombie capitalism and parties, Labour has embraced the politics of the living dead – as seen in this empty leadership contest – and in a state of paralysis and undead. This matters to all of us: diminishing politics, democracy and how it is possible collectively to oppose and defeat the combination of Conservative statecraft and a deep ideological project of the right. Labour have to wake up, change or get out of the way of a very different kind of politics.Notes1. Matthew Norman, ‘Labour’s tragedy is that Jeremy Corbyn is much the best leadership candidate’, The Independent, July 15th 2015.2. This is a point made in one of the best books on Labour in the last 40 years: Henry Drucker, Doctrine and Ethos in the Labour Party, Allen and Unwin 1979.